PAINTING AND DECORATING SPECIALIST. Est 1990. Welcome to ColinEwart.co.uk Painters & Decorators. Our company was established in 1990 and we are proud to offer an unrivalled reputation for customer service excellence and quality workmanship. 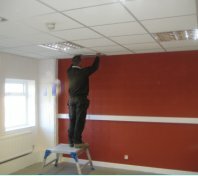 We provide a comprehensive range of painting & decorating services to both domestic and commercial sectors in the West Wales area. We are able to provide all aspects of painting and decorating including interior and exterior. portfolio of services we can offer. If you require further information click here... in order to complete our 'Contact Us' page or Telephone (01970) 828449 and our Customer Services Team would be only too happy help.